NYU Buenos Aires gets “Breathing Room”! Breathing Room: a drop-in group made by students for students to have a safe space to talk and share their experiences while studying away. 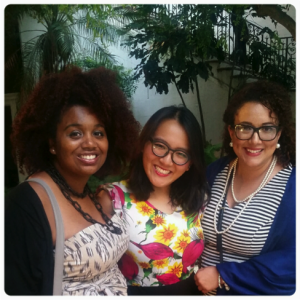 In Fall 2015 NYU launched a Master´s level study semester program at the NYU Buenos Aires global site. 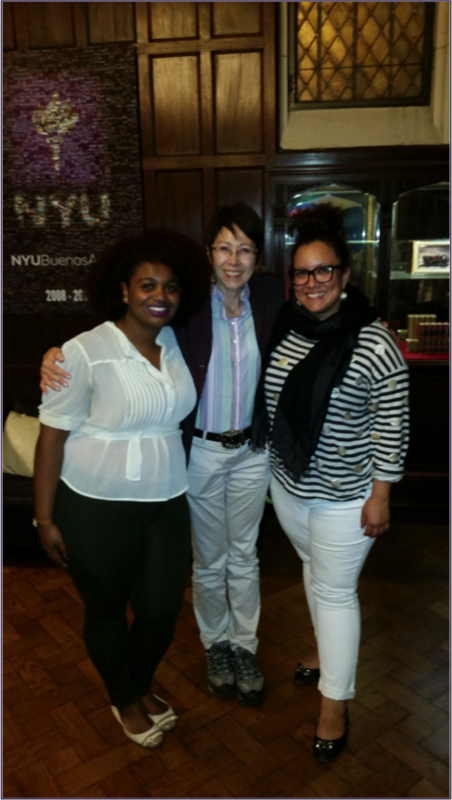 Two second-year MSW students from this pioneer program of NYU’s Silver School of Social Work, Nohelia Diplan and Monika Estrada Guzman, also set in motion last fall a student-led safe zone called the Breathing Room – an inclusive convocation to all students for “a drop-in group made by students for students to have a safe space to talk and share their experiences” during their study away in Buenos Aires. The idea emerged in April 2015 after both students attended a Safe Zone Training and Break Out Sessions facilitated at NYUBA by Selima Jumarali (Assistant Director of the Center for Multicultural Education and Programs [CMEP]) during her special visit to the NYUBA site. The issue of social identity and diversity, and specifically how to help students manage a new culture’s codes around these concerns, is a something that NYUBA site leadership is continually seeking more resources for, among which the CMEP “Global Diversity Training and Professional Development Grant” was deeply valued and delivered new, positive tools for all, staff and students alike. Afterwards, MSW students Monika and Nohelia chose to use the new acquired experience from Selima’s workshops to step forward themselves and see if students would respond to a student-offered Safe Zone that they believed would be vital to their semester. Their idea met with enthusiastic support from NYUBA Site Director Anna Kazumi Stahl, NYUBA Wellness Counselor Sarah Akhter, NYUBA Asst Dir for Student Life Paula Di Marzo, and SSSW program leader Gisselle Pardo, who all stayed in contact with Monika and Nohelia from their specific roles, as the student group got set into motion. The vision was to stimulate an encouraging space for students to voice different issues being experienced abroad and to face them through expression amongst peers while abroad. Monika and Nohelia did not intend to create a faux therapy session which they said, “would drive an emotionally and psychologically taxing experience.” Instead, they aspired to create a group sharing experience that was not group psychotherapy but rather an egalitarian space in which to create meaningful conversation. With both the space’s characteristics well-defined and the supportive contact with pertinent site staff, Nohelia and Monika set out to create the Breathing Room. Immediately, they saw that students had a need to talk and voice their experiences and that the Breathing Room was an impetus to unite students around expressing their needs and struggles while away. After the first session, a “topic box” was created for participants to propose topics and unveil these issues in this safe environment. Topics ranged from culture shock, to diversity, to maintaining a healthy life style while abroad, to staying in contact back home, to race and identity issues and women’s issues in different cultural contexts. At the very first gathering, a favorable turn-out of students gave NYUBA’s “Breathing Room” space for pairing up and sharing experiences organically and directly between the students. Monika claims that this particularity set the foundation for a democratic characteristic. The immediate connection among the participants set an egalitarian dynamic that flourished throughout the semester developing a structure free of hierarchies. Without infringing on this equal platform, both Nohelia and Monika also mentioned they were able to implement course skills acquired from their Social Work education, especially in the area of empowering and advocating for those without a voice– in this case students. Nohelia and Monika, acting as facilitators, were pleased with the ownership demonstrated by participating students throughout the course of the semester. This ownership and union amongst the students created the desired safe space for all, it also sufficed as a catalyst for both Nohelia and Monika to begin thinking of the future of the Breathing Room. The future of the Breathing Room lays in the hands of the students, of course, and both Nohelia and Monika had this crystal clear from the beginning. Noting strong interest in a few underclassmen, both Nohelia and Monika began developing relationships with two undergraduate students, Marsho Ho and Valerio Farris, who will be on site again this coming fall semester in 2016 to take on the role as facilitators. Furthermore, both Nohelia and Monica have been dialoguing and working closely with the Wellness Counselor Dr. Sarah Akhter, Student Life Assistant Director Paula Di Marzo, Gisselle Pardo, LCSW, MPH (Leader of the McSilver Institute´s global education programs) and Director Dr. Anna Kazumi Stahl– exchanging their experiences with each as they developed a manual for future students. What´s more, both students hope to have an opportunity to hold a few informative meetings with Students back in New York before their departure, encouraging students to be active by sharing their experience with the Breathing Room this past semester. 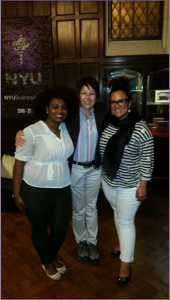 NYU Buenos Aires as a community has been enriched immensely by the Breathing Room and look expectantly ahead as the study away programs here at the site will forever hold a new facet due to the intrepid ambition demonstrated in action by Nohelia Diplan and Monika Estrada Guzman.